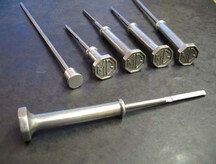 Vintage MG Parts manufacture the full range of MMM engine oil dipsticks. We have carefully researched variations and we have identified that a wheel spoke was originally used by the MG factory to form the stem section which was then pressed. We initially tried to replicate this feature although unfortunately, modern wire guage diameters are different to the 1930's type and these cannot be reproduced. We have therefore, used 7/32 inch diameter bright bar for the stems and all stems are correctly calibrated for each model. The underside of the dipstick tops on the long handled type, i.e. F, N and late P Types, had fluting whilst the short handled tops, i.e. early P, L and K Types did not. Vintage MG Parts have successfully reproduced this feature. When ordering a dipstick for the K type, please advise which engine is fitted as late K types including the late K1, were fitted with KN engines. Therefore, when ordering for the KN engine, please order an N type dipstick. All dipstick tops are made from LM6 to provide a highly polished finish as opposed to the original, poor quality mazak casting. With reference to dipsticks for the F, J, D and M Types, the dipstick enters the engine via the engine block as opposed to the sump. We have found that the dipstick hole size in the blocks vary with early blocks sometimes incorporating an under-sized hole. All our stems are 7/32 inch diameter and therefore, owners with early blocks can either bore out the hole or emery the stem prior to fitting. 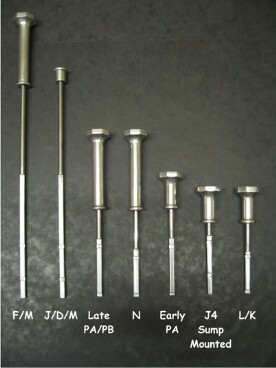 We also manufacture the special short J Type (sump mounted) dipstick and holder as well as rear axle/differential oil dipsticks and engine sumps for the P Type, L/K Type and N Type. 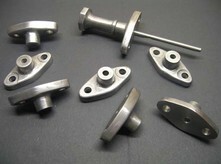 Also engine sump dipstick holder castings for the K and L Type models.